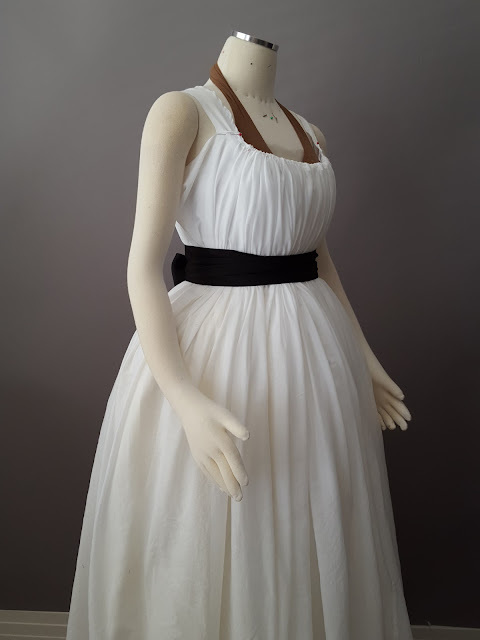 As happens with all big costume events or trips, it gets to be about a week out and I decide I *NEED* such-and-such new gown, and that surely it will be quick and easy to put together. Except this one might really be. The idea for a Chemise a la Reine came when considering the weather in Williamsburg next week - warm and rainy. Steamy. When considering my 18th century gowns, I found myself at a disadvantage with my silk gowns AND my faux silk gowns, leaving me with precious few options. So what will withstand both heat and moisture? Cotton voile! I happened to have just enough for a full and fluffy Chemise a la Reine, so I studied the diagrams in The Cut of Women's Clothes: 1600-1930 , and on Fresh Frippery's blog, and set to it at 10:30 pm last night. Here's what it looked like before the waistline was gathered - a huge tent! It really is easy. I used one huge width of cotton 165" wide (in hindsight, this is more circumference than you need, but makes for a very full and fluffy gown. The Cut of Women's Clothes: 1600-1930 pattern has about a 138" width. If you're using anything heavier than voile, reduce your overall width, otherwise your bodice will be too bulky), made three gathering channels along the top according to Fresh Frip's diagram, and gathered it all up on my dress form. Initially I stitched in a channel 9 inches below the top edge, but found it too short in the back when I gathered it, so had to rip out most of that and re-stitch it according to my markings at the waist while on the dress form. The back pinned to the underbodice structure. Cut and stitch in the sleeves - the trickiest part. I will be using slim, two piece sleeves. Sew the straps - I made a quick cotton foundation bodice that pins closed at front, under the gathers. The straps are part of it, so I just need to do the finishing "cover" with the voile on the outside. Level the hem - it's longer in front than back. 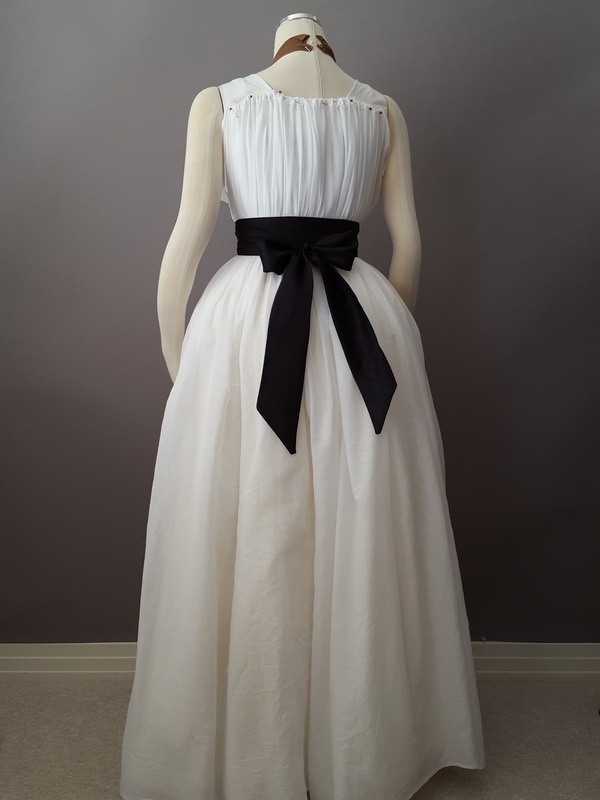 Possibly add a neck ruffle - many gowns had them, so I may add one depending on time. And that will be it! YAY! This is gorgeous - and, for this area of Virginia right now ... I kind of want one! Cannot wait to see it finished, but even in this state it's lovelier than most dresses on offer. Have a good time in the Commonwealth! Thank you! I'm hoping it keeps me cool. It's looking very nice! I'm glad you found my diagrams useful! Will you be wearing your dress to Costume College? I look forward to seeing your finished dress! I haven't decided yet - I guess it depends on how much sewing I get done between now and August! Looking beautiful so far! I love chemise gowns but have yet to attempt making one, someday I hope! You will be pleasantly surprised at how easy they are compared to the more fitted gowns. No wonder they took off, so comfortable and quicker to make. Even though the cotton would have been really expensive and labour was cheap! And very scandalous! 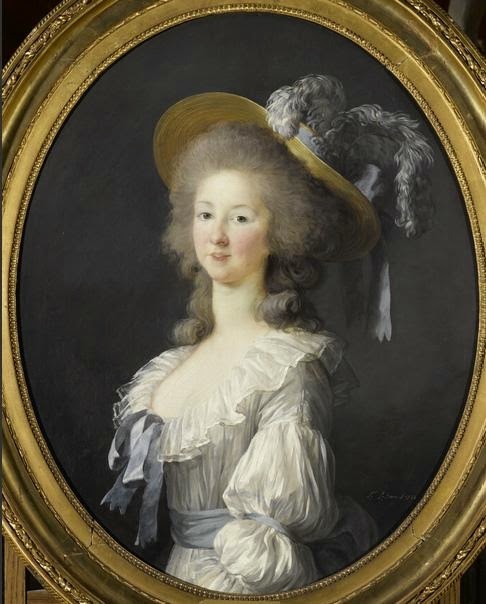 There are portraits depicting ladies wearing nothing at all beneath, but I doubt that was actually done. You still have the stays and petticoats, but you wouldn't have to lace your stays so tight - I guess kindof like a forerunner to a tea gown. How can you be so quick? It would take me days or weeks! It looks lovely already! This type of dress is so fast - three channels on the neckline, one around the waist, there ya go, so quick. It's the sleeves and straps that then add the time on. Ehhhh??? Is cotton voile easier on the paws to gather, hem etc. than organza? I certainly hope so. And yes, I am amazed, jealous, wistful and so proud of your speed. A marvel to be sure. Hope there are pics!! Which shoes get the honor with this one? Yes. OH YES. Cotton is way easier to work with. I will be wearing black Dunmores with this gown. sigh...I can already see this is going to be simply lovely. you are correct to want something like this to wear here in Williamsburg in this kind of heat- I live 45 minutes away from Williamsburg in King William county and the heat is getting more and more humid. I can only imagine how brutal it will be to wear historical costume but it would be less so if you wear cotton, that breathes. I love historical gowns but the chemise de la reine is one of my all time favorites. I await your finished progress! I do hope it does keep me cooler. It's very thin cotton, but there's a loooooot of it gathered up. I may come home after melting in this and reduce some of the width in the front gathers. I can't wait to see you wear this dress! 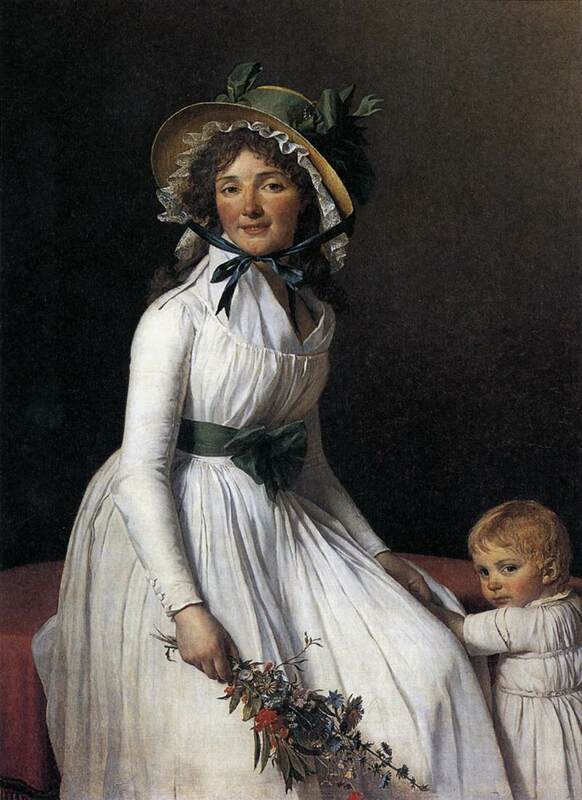 Other ways to fight back the heat in a 18th century fashion is to add sleeves to your corset or wear a robe volante! I'm interested in the volante. 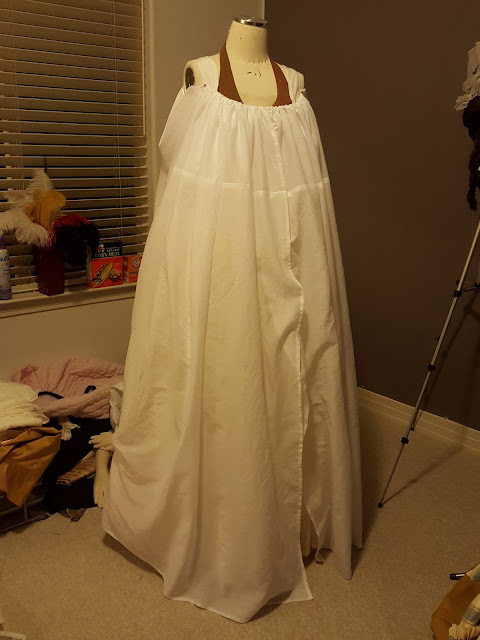 It's earlier than the period I usually focus on, but I'm becoming more interested in the first half of the 18th c.
I'm pretty new to sewing, so sorry if these questions are dumb! When you say channels, does that just mean rolling down the edge of the fabric a quarter of an inch or so, sewing it in place, and inserting a drawstring/ribbon? And if what I'm thinking is correct, how do you make a channel for the waist? Do you just tuck and pin the fabric up? Your pictures have inspired me to give this dress a try! Hi Abby - Yup, to make the channels, just turn down the edge about 1/2" and stitch, then run the ribbon/tape through. For the waist you can either do it as a seam and stitch the seam allowance down to make the channel, or you can fold the fabric where you want the channel to be and stitch, creating a little tube inside. It will look like a waist seam on the outside.